MAC Brush Cleanser cleans, disinfects and conditions the brush fibers so that brushes will last longer. Convenient to use, specifically designed to extend the life of high quality brushes, the MAC Brush Cleanser leaves brushes smelling fresh and clean, and helps shorten their drying time. Needless to say, I am pretty much in love with the MAC Brush cleanser. It's a lifesaver, specially since I like to have a clean brush every time I apply foundation, and I don't always have the time to wash the brush between uses. 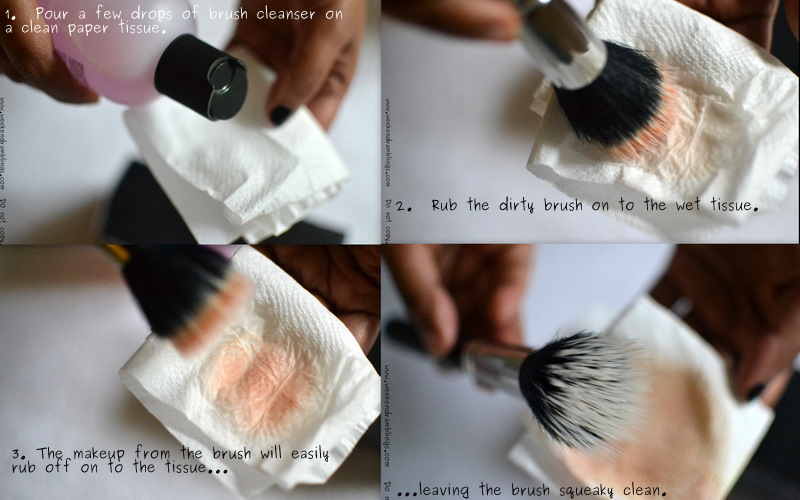 My brushes come out clean and soft, and there is no noticeable residue from the cleanser left behind on the brushes. I do, however, feel it is best to clean brushes with a gentle shampoo and water and leave the brush cleanser for times when you are hurried for time. Back To MAC Program: Because we share your commitment to the environment, M·A·C accepts returns of its primary packaging through the Back to M·A·C Program. By returning six  M·A·C primary packaging containers to a M·A·C counter or M·A·C Cosmetics Online, you receive a free M·A·C Lipstick of your choice as our thanks to you. Since 100% of the retail selling price of Viva Glam Lipsticks is provided to organizations that help people living with HIV/AIDS, these colours are excluded from this program. That was my first buy from MAC. Are you a MAC fan? What was your first purchase..and if you haven't bought anything yet, is there a product you really really want to try from MAC? Am - mmm probably was a huge MAC fan. I had used up deep truth, amber lights and a b'ful plum e/s which were the best :D I still have and love amber lights!!! @Radhika You're not a MAC dodo :) .. don't go down that eyeshadow path, it leads to an empty pocket. Hehe, jokes aside, if you really feel like playing around then you can spend some time swatching at the MAC counters. That's kind of my favourite de-stress activity. I wander around and play with the colours. This one looks so good...I want! O in that sense i am not a big Mac-cie when compared with lots.